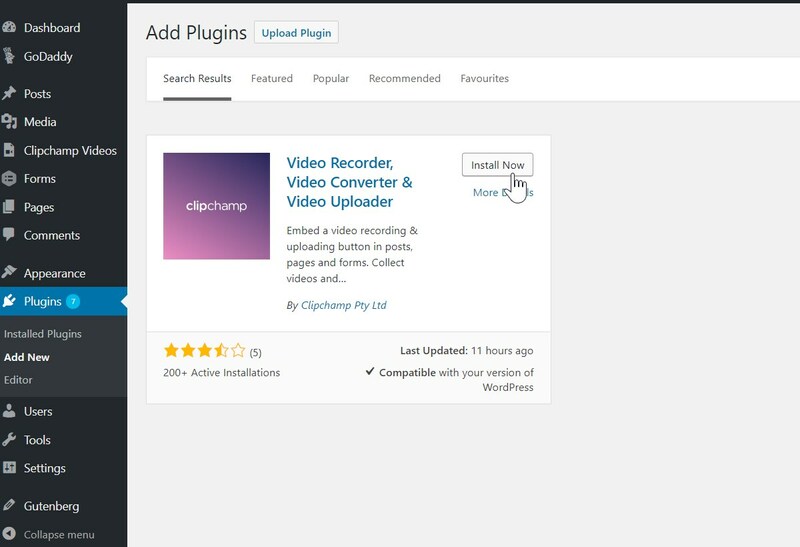 Go to the Clipchamp entry on wordpress.org or search for Clipchamp in the plugin directory in your WP admin panel. Install the plugin as you would any other WordPress plugin. After installing the plugin, activate it. or you can go to Installed Plugins and activate it there. 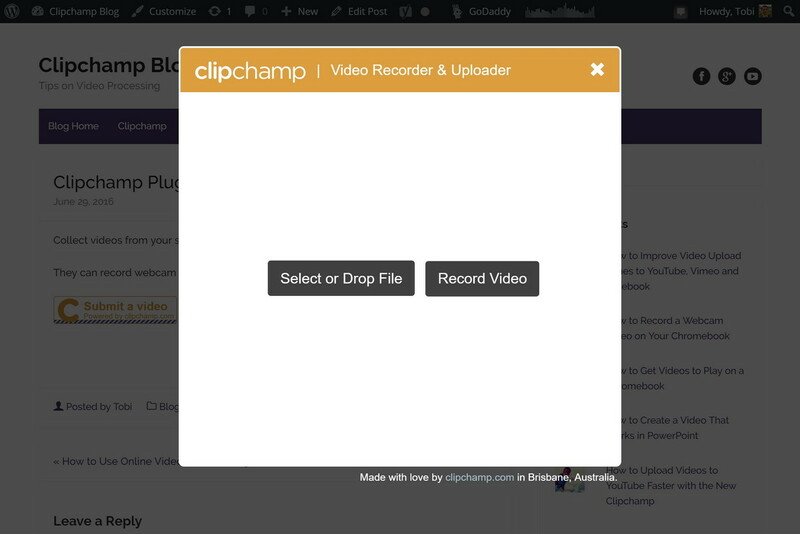 After activating the plugin you'll be taken to its settings screen where you can register for a free trial of the Clipchamp video API, which the plugin is based on. All trials are on the API Business plan and include all features of the API. You can select a plan other than API Business at any time during the trial or remain on API Business to continue after the trial ends. 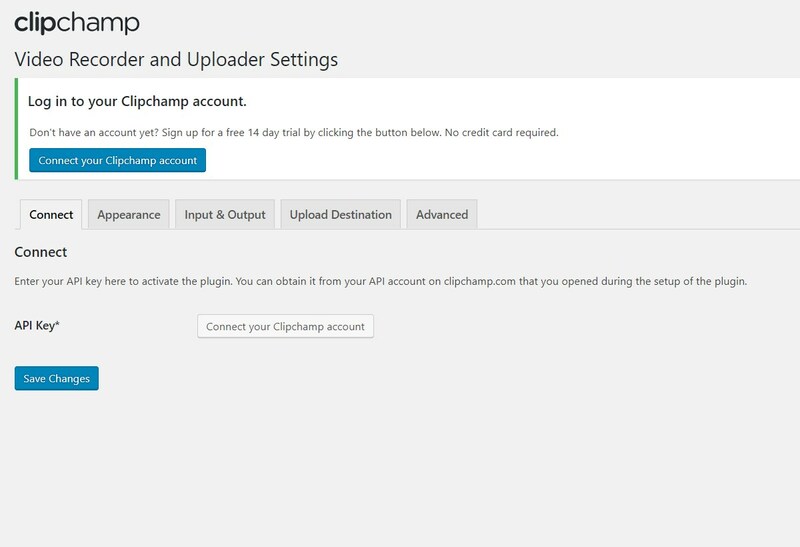 You can also cancel at any time in your Clipchamp user profile or simply let the trial expire. 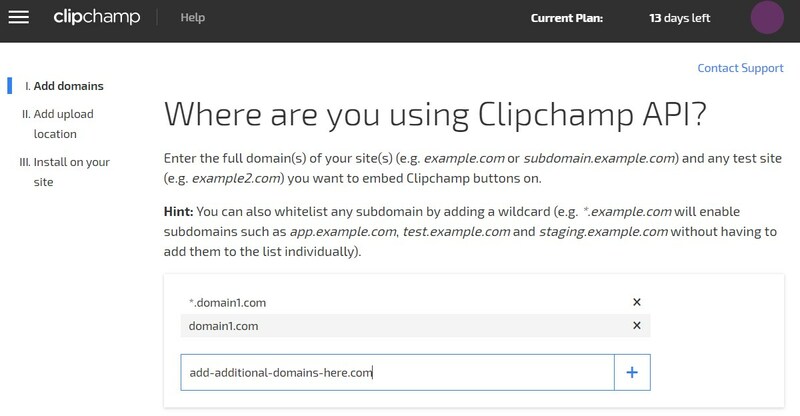 You can add multiple domains, whichever you add here will be enabled to work with your Clipchamp API key. 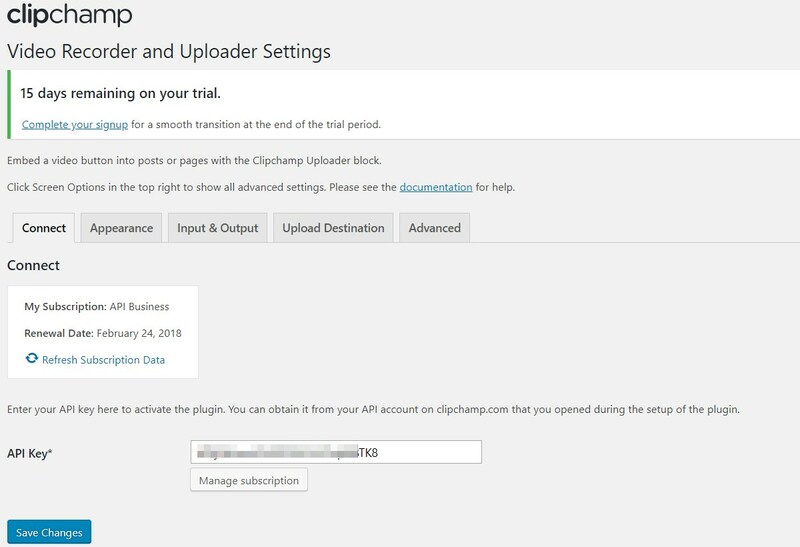 As mentioned above, we'll automatically add the domain of your WordPress site that you installed the plugin on to your Clipchamp trial's allowed domains list as part of the plugin setup process. 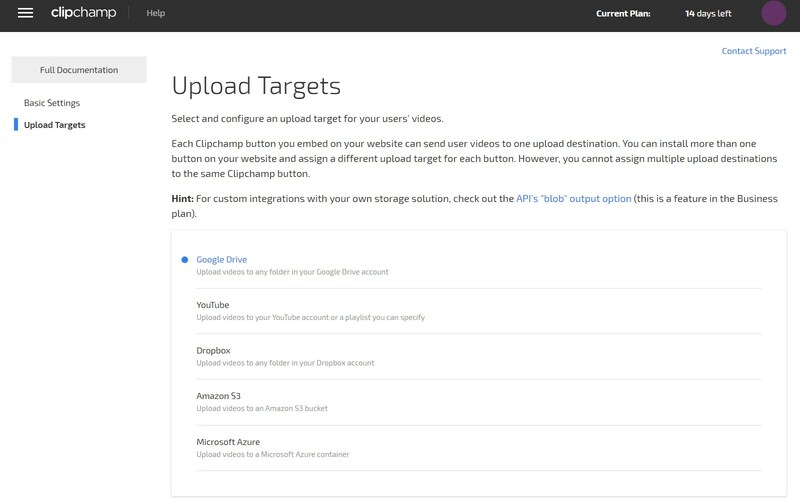 Depending on the destination of video files you'd like to use, you need to connect your YouTube channel, set up and configure an Amazon S3 account, a Microsoft Azure account, connect to your Dropbox account or to your Google Drive account in the Clipchamp API configuration. 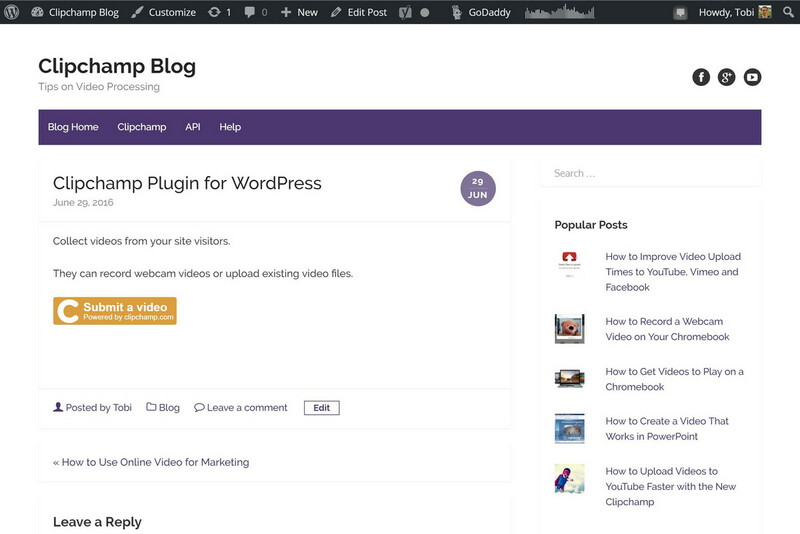 Sending user generated videos from the WordPress front-end to the WordPress Media Gallery is also possible. If you'd like to make videos that users upload available as posts on your website, you can enable the plugin's Video Posts option. 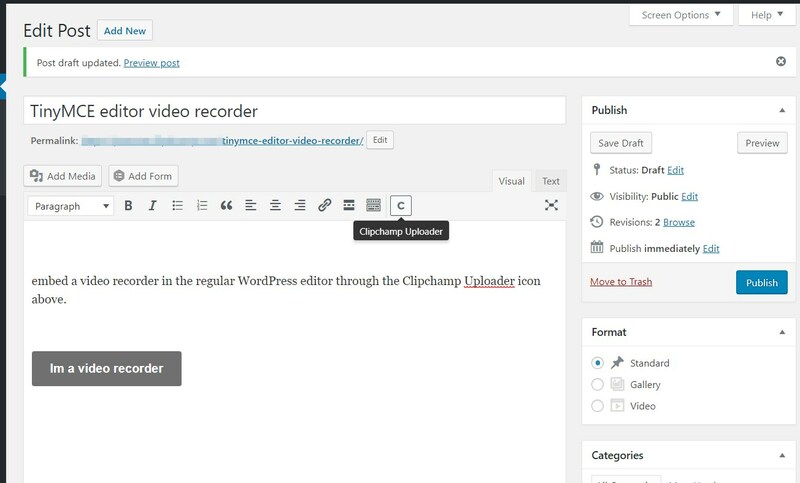 This recent addition to the plugin makes it possible to publish user videos to your WordPress website just like you would publish blog posts or articles. There are links to set up instructions for each of these options in the Plugin settings. 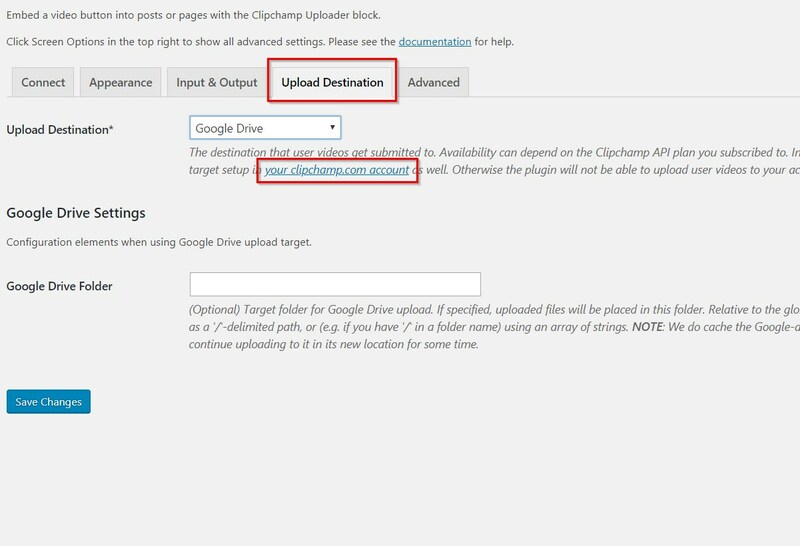 5a) First, go to "Upload Destination" in the plugin settings in your WP admin backend and select the upload target you want to use. We're using Google Drive as the upload target in the sample screenshots below. 5b) Then, go to https://util.clipchamp.com/en/api-setup/integrations and add your login credentials for the upload destination you'd like to use. This will ensure that the recording plugin is allowed to submit your users' videos from your website to your upload destination. Use the tabs in the settings screen to configure the plugin options you'd like. If you're unsure which ones to select you can also leave the default options in place. 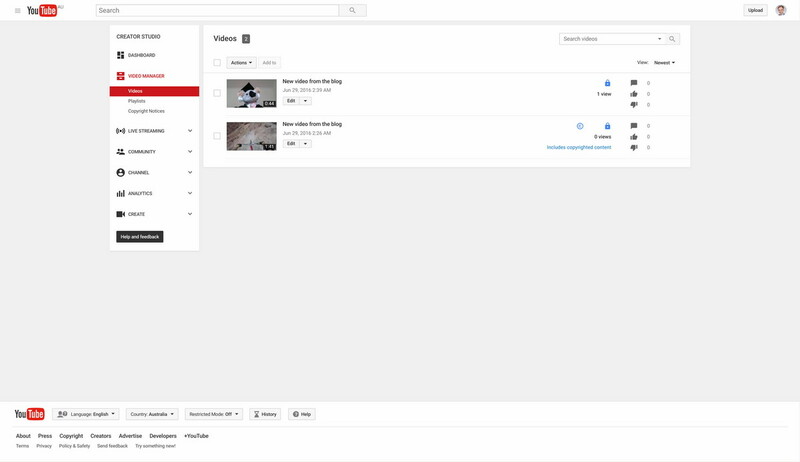 After some testing and initial uploads of user videos, you can tweak the settings as you see fit. Options include items such as changing the button size, label and colour, selecting a layout theme, setting the video output format and others. To access all available advanced features, click on Screen Options and check Show Advanced Settings. After the trial, options can differ depending on the Clipchamp API plan you signed up for. 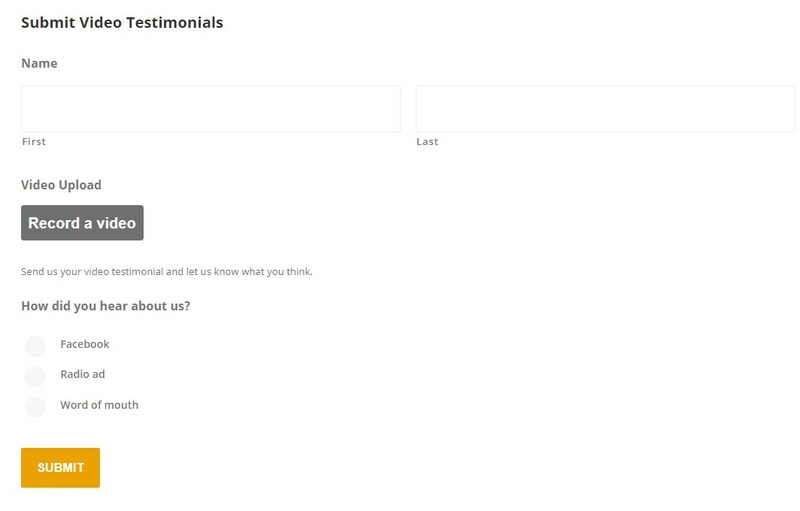 You can add a recording button to a post, page, Gutenberg post or a Gravity Forms form. You can't add more than 1 recorder & uploader to a Gutenberg post or Gravity Forms form at the moment. 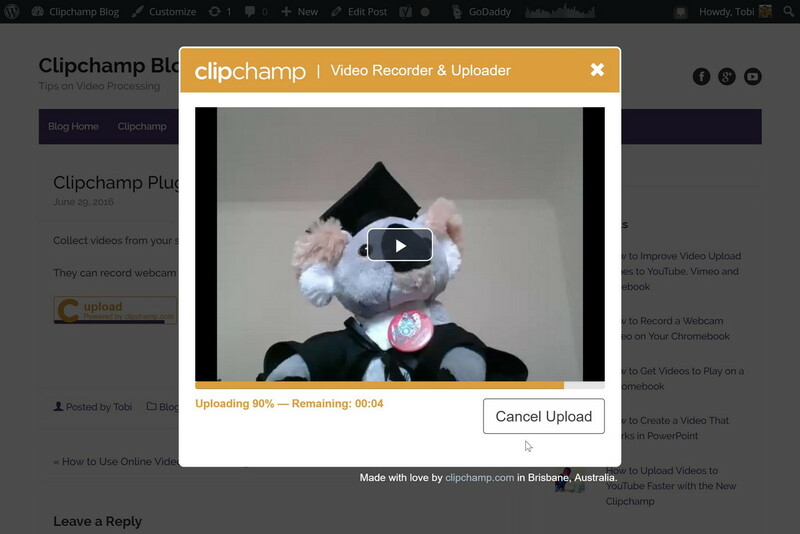 In the default editor, click on the Clipchamp Uploader icon in the editor menu to add a recorder button. 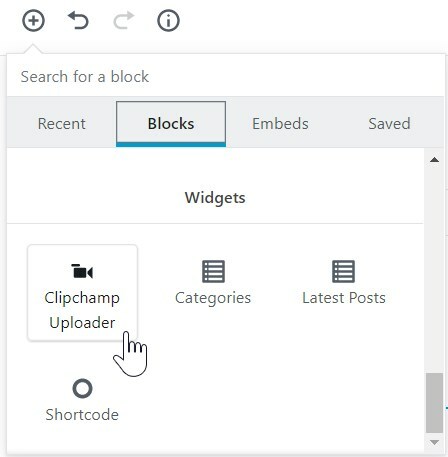 In the new Gutenberg editor, click on the + icon, then Blocks, then scroll to Widgets and select the Clipchamp Uploader icon to add a recorder button to your post. 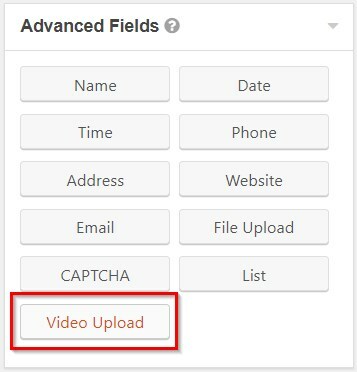 Access recorder button settings by clicking on "Show Advanced Settings"
In Gravity Forms, you can embed our video recorder by creating a new form or going into an existing one and clicking on Advanced Fields. In there find the Video Upload item and drag it into your form editor. 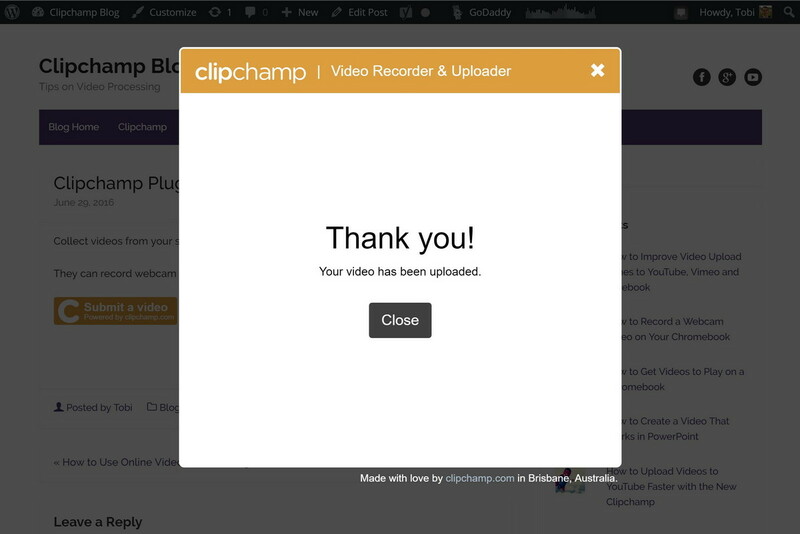 That's the end of the basic setup tutorial for the Clipchamp video recorder for WordPress. Read on to see some screenshots, access a demo button and learn about some advanced options. Here is a sample WordPress blog post with an embedded Clipchamp button in the Test it right here section. And below are some screenshots that show a sample implementation of the recorder in WordPress. You can change text and colour. There are many configuration and branding options to change the look & feel of the user-facing elements of the video recorder and video uploader. There are also many settings to tweak that change the compression, conversion, recording and destination options. All of them are available in the plugin settings in your WordPress admin panel. To access all advanced features, click on Screen Options and check Show Advanced Settings. 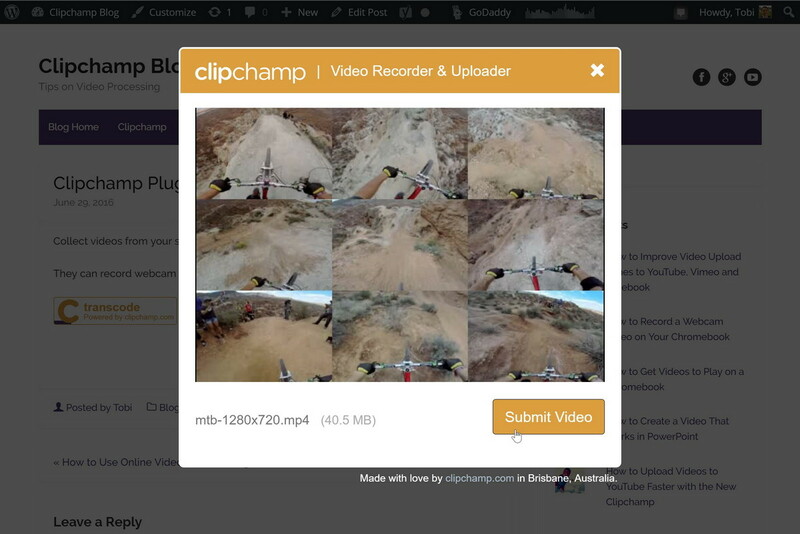 We also publish tutorials on a regular basis that walk you through specific use cases of collecting videos from your site visitors and demonstrate how to use the video plugin to achieve them. For instance this one shows you how to embed a video recorder in posts/pages so that videos get uploaded to a different Google Drive folder depending on the post they were submitted from, helping to keep track which post these uploaded videos belong to. 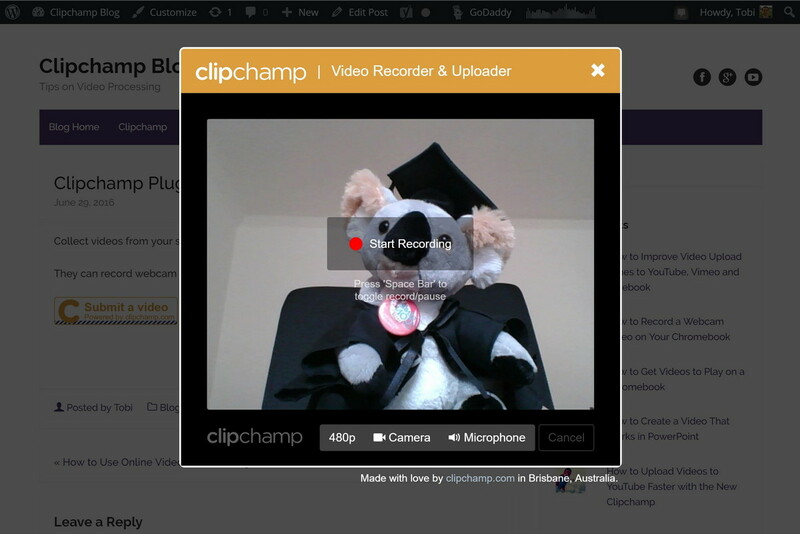 Our recording plugin also includes a range of customisation options to adjust the recorder and uploader to your site’s needs. One of the ones we have recently added is an option to customise the downstream process after a video was recorded and uploaded using our service. This option is available in the "Advanced" tab of the plugin settings. 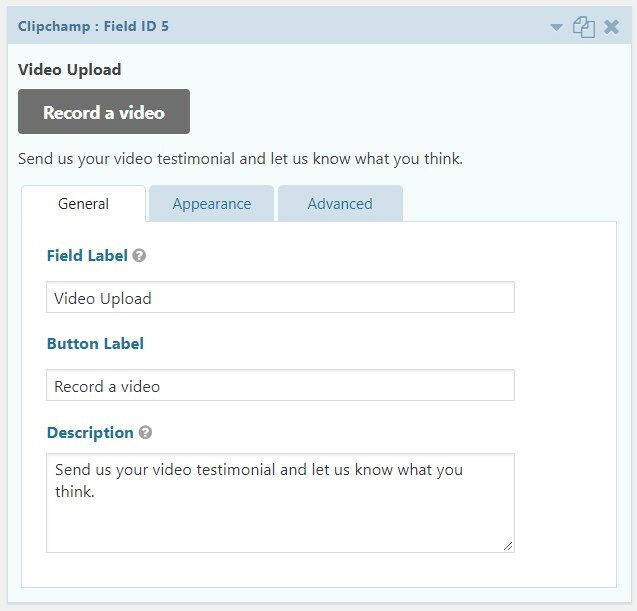 For example, you can redirect your users to another page, where you request more data and in this way, make the Clipchamp video upload part of a screen flow of forms (such as in a questionnaire). 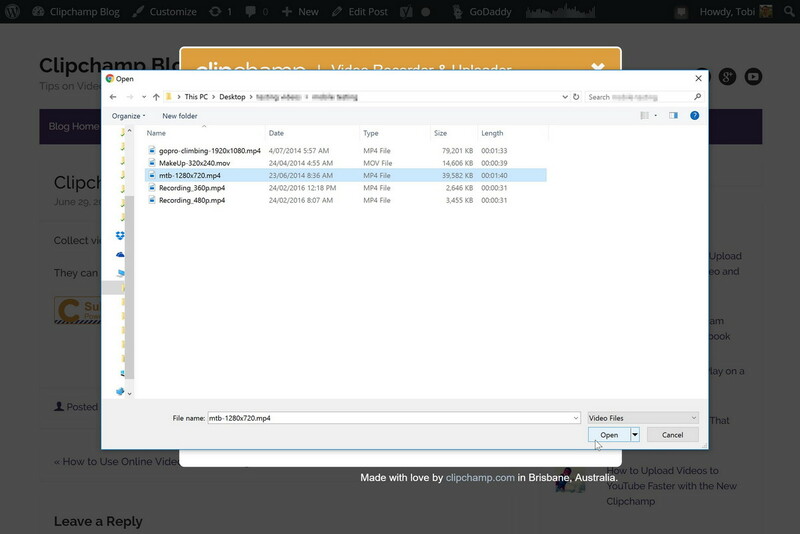 We're adding new and additional features to the Clipchamp API on a regular basis, which will then also become available in the WordPress plugin.